boat towards Australia. The boat they were shuffled on to caught fire and sank. Two people died. Mr Jawadi’s family then spent three years detained on Nauru. It was only when a fellow refugee sewed his lips together, sparking a broader hunger strike across the detention centre, that their case was reopened and the family moved to Canberra. Mr Jawadi’s story is one of seizing opportunity after a rough beginning: “once you’re at the bottom, the only way is up – and I’ve been at the bottom”. When his parents fled Afghanistan, Australia was accepting refugees. But the family didn’t have the family ties or English skills necessary to be eligible. Mr Jawadi’s family spent two months in Indonesia before setting sail for Australia. They didn’t realise what “people smuggling” involved. “We didn’t know what was involved. We didn’t know you had to go by boat or anything like that,” Mr Jawadi said. After eight days they were intercepted by the Australia navy who eventually decided to take the group to Christmas Island. “The [navy] boat came in alongside of us. They gave us a picture of Australia with a cross over it, saying, ‘You’re not allowed in Australia’. Some people could speak English, someone screamed out, ‘They’re going to take us back on this boat’,” he said. “People started panicking and the captain, I guess, accelerated the boat to go faster but you could hear the wood start separating. All of a sudden I just see this black smoke coming from behind the boat. “Everyone started jumping out because it was sinking. Two women died tragically. We just heard everyone crying.” After a couple months on Christmas Island, Mr Jawadi’s family spent the rest of their three-year detention on Nauru, where his younger brother was born. harmed themselves. Eventually it gets to you.” After the hunger strike, detainees were finally allowed a lawyer and accepted as genuine asylum seekers, first on temporary protection visas and then as citizens. “I just saw my mum pour out [of the interview room] crying,” he said. 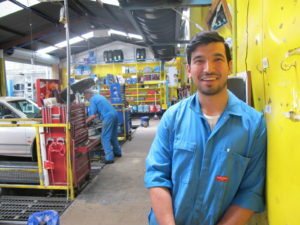 The journey didn’t end when Mr Jawadi arrived in Canberra, where he completed school and now works as a mechanic at CWC Autos. “The start was hard, very, very hard, especially going through school and making new friends, not knowing the language perfectly,” he said. “I just made friends – it got easier and easier. Freedom Stories will be screened at the National Film and Sound Archive at 3pm Saturday as part of the Canberra International Film Festival.